contact us for pricing and application questions. we can be reached at (269) 382-2050. TheKalamazoo Industries KM14 14 inch abrasive mitre chop saw can mitre cut ferrous materials such as angle iron, flat stock, bar stock 45 degrees left or right. 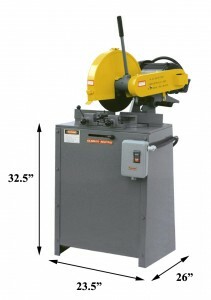 The saw was originally built to a customer’s special request for a rugged, high capacity 14” mitre abrasive chop saw. The Kalamazoo Industries KM14 14 inch abrasive mitre chop saw features cast iron construction, 4400 rpm spindle speed, sealed ball bearings, dual V-belt drive, and dual cam vises that open to 6″. Capacities are 2.5” solid, 3” pipe at 90 degrees, and 2” solid 2.5” pipe at 45 degrees. The saw is available with a powerful 5HP motor in 220 volt 1ph, or 220/440/575 voltages 3ph. Kalamazoo Industries KM14 14 inch abrasive mitre chop saw is great for angle iron, flat bar, tubing and all your steel fabrication needs! Holds either a 12″ up to a 14″ abrasive cutoff wheel. Mitres either direction 45 degrees. Standard dual cam lock vises. Heavy duty stand, front table lock, dual cam vises. Capacities: 2 1/2″ solids,3″ pipe, 3.5″ at 45 degrees. Shipping dimensions: L43″ x W45″ x H 63″, weight 400 lbs. 3PH amp draw: 230V 13.4 amps and 440V 6.7 amps. 1PH amp draw: 230V 22.5 amps. 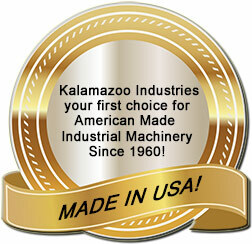 Kalamazoo Industries KM14 14 inch abrasive cutoff saw parts list.